1. Put maple syrup in a pot and bring to a boil on medium. When bubbles come out, turn down to low and simmer until thick tilting the pan (make sure you don't burn it). Drop a bit into cold water and check if it forms an elastic ball. If it melts, you want to simmer more. 2. 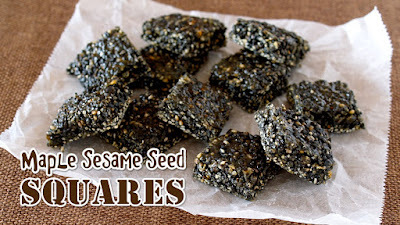 Add toasted black sesame seeds, spread it flat on parchment paper, cool it down, cut before it hardens (it is easy to cut in this way), then put in the fridge to set.